I received a Kindle Fire from my husband for my birthday/Christmas gift this year (those of us born in late December use that slash a lot). I don’t do product reviews often, but since this is both directly related to my writing career and a technological advance for me, it seemed relevant to discuss it here. I’ve mentioned before that I’ve never owned an e-reader and that I had my doubts about reading “on screen,” considering my deep love of books. Then I tried reading a few times on an iPod touch — and discovered that I loved the freedom of having a book with me at all times, especially in the various waiting rooms where we all seem to spend so much time. The iPod screen is tiny, certainly, but it was still surprisingly easy for me to read on it. Our oldest daughter carries her Kindle reader with her on her bus commute to work — almost an hour each way — and has commented often about how it makes the travel time pass so much more quickly. 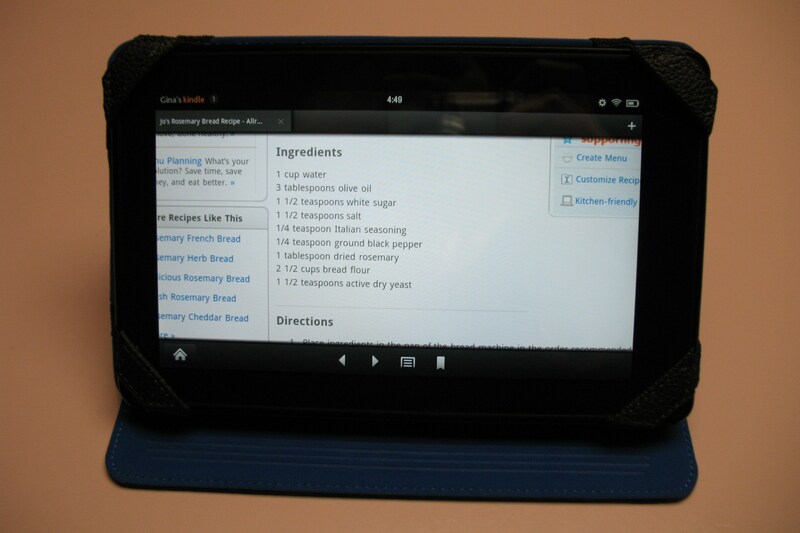 John decided it was time for me to have a Kindle of my own, and he choose to order the Kindle Fire from Amazon. The first accessory I bought was a cover. I choose a black leather cover with a bright blue lining from Belkin (approximately $35 from WalMart) that also folds into a stand. I like this cover because it’s very slim, adding little bulk to the Fire, and had a good feel in my hand. I have to confess, I like the fact that when it’s open and I’m reading inside the cover, it feels like I’m actually holding a book. The photo above is a little dark, but you get the idea. Cover and all, the Kindle Fire is about the size of a paperback, fits easily into my purse (average size, I don’t like to carry the extra-large ones that make my shoulders ache), and weighs about a pound. Not bad at all. It was ridiculously easy to download a book from the Amazon Kindle store (maybe a little too easy! It’s like living in a bookstore – dangerous for us book lovers). I had no trouble going to facebook or accessing my email. The settings were easy to find for brightening and dimming the screen, turning wi-fi off to save battery life and so on. On the whole, easy enough for even this techno-challenged mom to figure out. I’ve already read two books and two novellas on it, and honestly, I lost myself in the stories just as easily as I ever have. I’ve also read a hardcover book since Christmas (I’ve been on quite a reading binge), and I still love reading from a “real” book — but I wouldn’t carry it with me out of the house the way I can my Fire. One of my favorite uses may very well be in the kitchen. 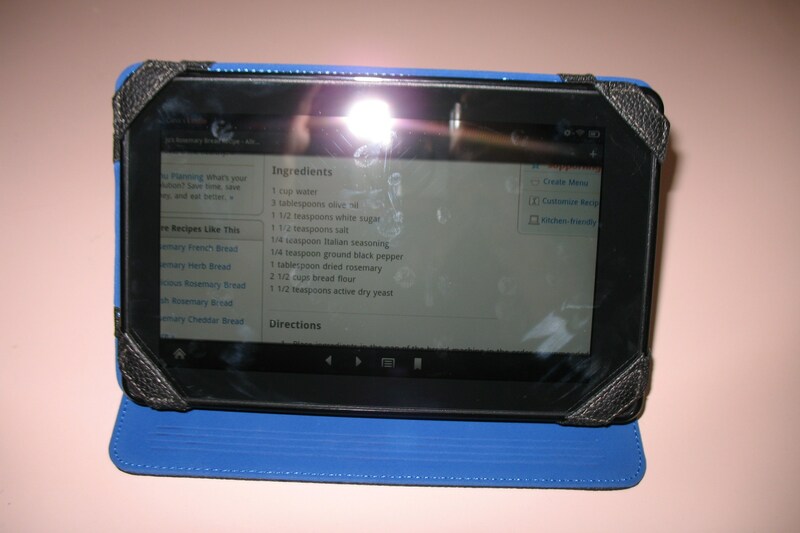 Using the stand, I can display a recipe from allrecipes.com or one of the other sites I visit very often, set the little Fire out of the way on the counter, and refer to the displayed recipe as needed. I’ve done that several times already. The Fire came with a free month’s subscription to Amazon Prime. One of the books I read was “borrowed” from the Amazon Prime library (you are entitled to borrow one book a month from the eligible titles), and I streamed a movie from the free choices offered. The film looked fine on the seven-inch screen and the sound was very acceptable from the speakers. Will I renew the Prime membership? Probably not, at least for now. I don’t order enough to make the free two-day shipping worth the (admittedly reasonable) cost, and I wasn’t excited enough by the range of book or video offerings to make it worthwhile for me, though that could change in the future. But I tried it all while I have it. The battery life has been sufficient for me so far, though of course I haven’t really put it to the test. I had plenty of power to watch the two-hour film and then read a while before I noticed it was getting low. I think it said it would get seven or eight hours of use on one charge. Fine for my uses. The only quibble I have so far? That shiny screen and the resulting fingerprints make my somewhat OCD soul cringe! I spend a lot of time polishing with a microfiber cloth. Colors really pop on screen, but it does take some effort to keep it shiny. 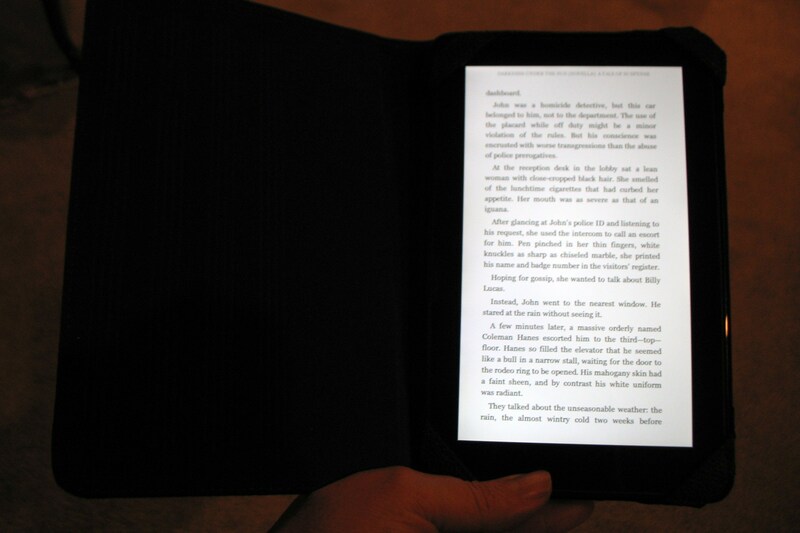 If you don’t have a Kindle device, the Kindle app is a free download from your phone, iPod or iPad or PC from Amazon. Books are reasonably priced, and there are many, many free titles available! All in all, I can give this product two thumbs-up (and then scrub the resulting thumb-prints away with my handy polishing cloth). Thank you for my gift, John. I know I’ll get many hours of enjoyment from it (and thanks to the “kids” for Amazon gift cards — which will be put to good use in the Kindle bookstore!). Look for my Harlequin Special Edition, DOCTORS IN THE WEDDING, in stores, at Harlequin.com and for e-readers now! (Click the Books Available Now! tab above for details). And be sure and “like” my facebook page (link at right) for occasional updates and comments.